Doing the right thing is good business! I’m constantly asked by clients to find them rental property in the Los Angeles market that “cash flows” — meaning that the monthly rent received on the rental property exceeds the monthly expenses (mortgage interest and principal, insurance, property taxes and maintenance). 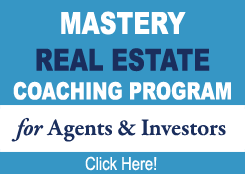 These clients are often exhausted with the up-and-downs of the stock market, see the real estate market turning a corner, and want to put their money in a more secure asset (real estate) that will appreciate over time. Makes perfect sense, right? Well, it depends…. Generally, people feel most comfortable making a real estate investment in their backyard, no more than 20 minutes from their personal residence — a property they can physically drive across town to see and touch should anything happen. This relative “closeness” to the property gives them the peace of mind and security that lets them sleep well at night. But the truth of the matter is that buying a rental property in their backyard may not be the sound financial investment they were hoping for…and this is sure to cause some nightmares. 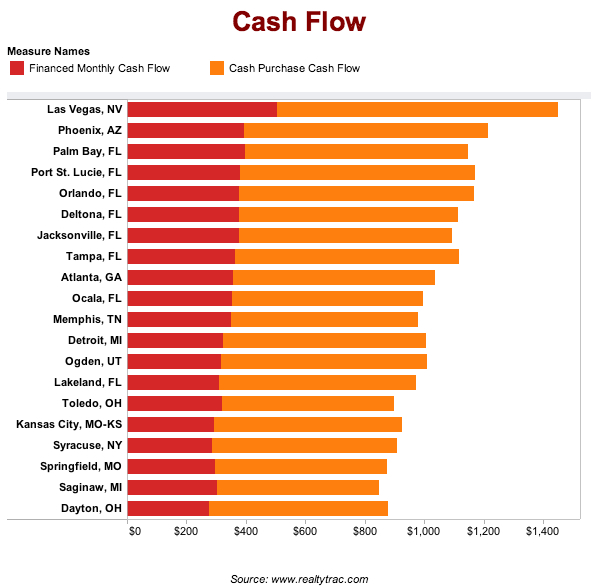 RealtyTrac just released a study highlighting the top 20 residential rental markets across the U.S. based on cash flow. Notably missing was (you guessed it) any city in Southern California. That’s because it’s becoming increasingly difficult to buy a rental property in the L.A. area, for example, with a effective cap rate (annual net cash flow) of even 5-6%. Granted, this is significantly higher than most investors earn in the stock market or any bank savings account but it is a relatively poor return when looking where else around the county they could invest their money or considering other real estate investment options (ask me about this). 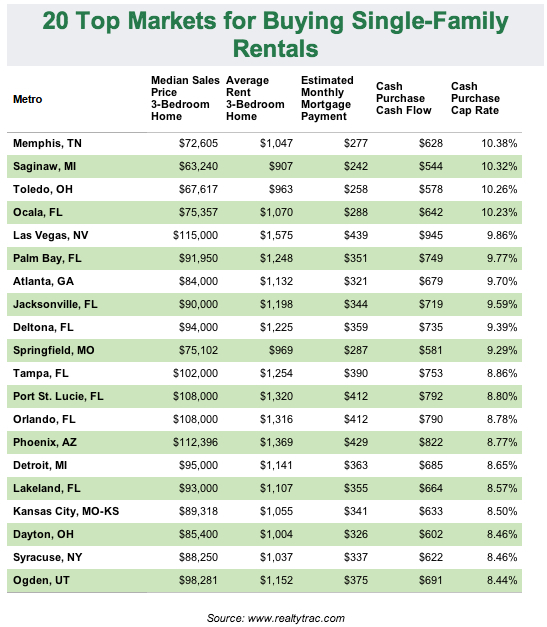 Where can you make the most money as a rental-housing landlord? Not California, according to a study released today by foreclosure-tracking firm RealtyTrac. Using a formula that calculates cash purchase capitalization rates—or the annual net cash flow an investor can get from a rental property if it is purchased with cash—RealtyTrac found that Memphis, Tenn.; Saginaw, Mich.; Toledo, Ohio; and Ocala, Fla. were the most profitable places to rent out single-family homes. 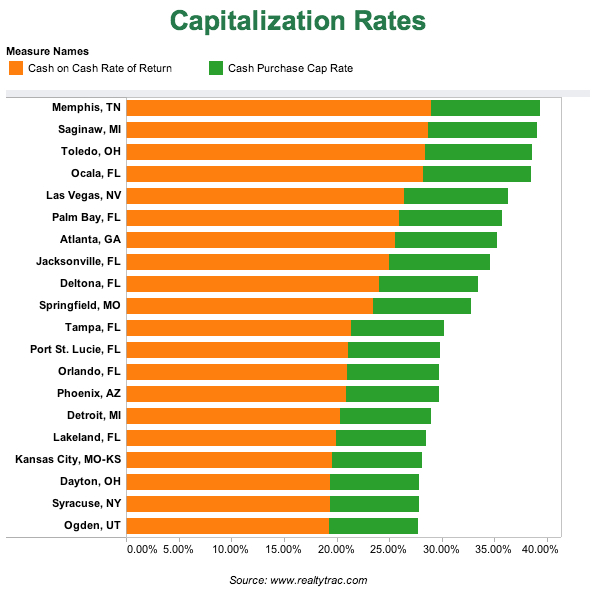 Each of these markets has an annual cash purchase cap rate of more than 10%. The calculation goes something like this: The median price for a three-bedroom home in Jacksonville, Fla., is $90,000, according to RealtyTrac’s numbers. The average rent on a three bedroom is $1,198. After setting aside money for taxes, fees and maintenance, the cash flow from renting such a property is $719 per month. Divide a year’s worth of cash flow by the purchase price of the house and you get an annual yield of 9.59%, the eighth-best in the country. That’s 2 to 4 percentage points higher than what most large institutional investors, including Blackstone Group LP and Colony Capital LLC, have projected in the way of returns for their single-family rental portfolios. One shortcoming in RealtyTrac’s research on this subject, however, is that it doesn’t examine how much supply is available to investors in the markets it rates for landlord profitability. Over the last year, investors have gravitated towards markets with lots of supply and a legacy of foreclosure problems, because they know they can easily generate profits if they buy at a low enough prices. But what if the inventory drops or there are large price increases? The answer, says RealtyTrac vice president Daren Blomquist, is that the rental cap rate calculation helps individual investors who are buying homes one or a few at a time, rather than large institutional investors looking to buy hundreds or thousands of discounted homes in a single market. “We created this [report] with our customers in mind—the mom-and-pop, individual investors,” Mr. Blomquist says. “The folks I’ve talked to who are acquiring these in bulk or in larger quantities are saying that because foreclosures are starting to dry up, more and more they’re buying homes off the MLS,” he added, referring to multiple-listing services, the local databases of homes for sale used by Realtors. Only a few of the markets favored by large, institutional rental investors made RealtyTrac’s top 20 list, including Las Vegas (No. 5), Atlanta (No. 7), Tampa (No. 11), Phoenix (No. 14) and Detroit (No. 15). Most notably absent are any markets in California. Beaten-down housing markets in both Southern and Northern California have caught the eye of investors over the last two years, and rising investor interest has driven up prices. California markets don’t make the list, Mr. Blomquist says, because prices there have risen so significantly that it’s hard to make renting profitable.